Umit Bali, a Fijian-Indian Australian with an American accent and whose first name is kind of Turkish. 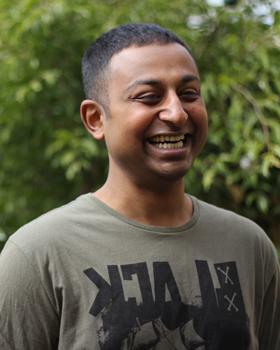 When comedian and former-illegal immigrant Umit Bali toured his smash-hit show Flight Plan in 2015, reviewers and audiences worried that he couldn’t top his tales of coming to Australia from Fiji as a child and spending more than ten years fighting to stay here legally with his parents and little sister. With his new festival show Aussie At Last! Those people need not have worried as Umit again brings a cracking new hour of comedy about ethnic parents, arranged marriages, and his impending return to Fiji. Although relatively new to the Festival circuit, Umit performs regularly in some of Sydney’s best comedy clubs, where he tells stories and jokes about friendships, family and belonging and culture. Umit’s positivity and cheerfulness, mixed with his breakneck speed delivery makes his comedy infectious.